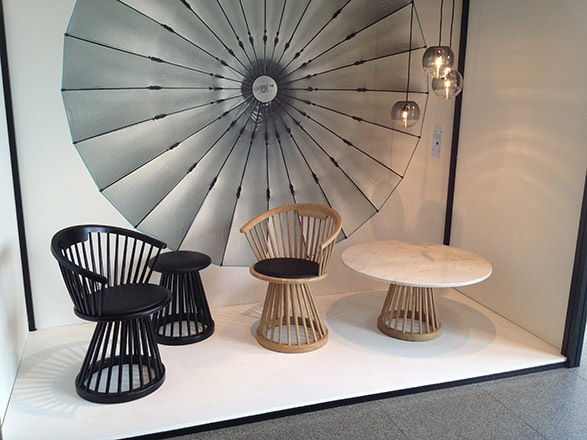 Last week saw the return of the most important furniture fair in the world, ‘iSaloni’ in Milan. Showcasing the biggest furniture and lighting brands during the 52nd installment, over 2,500 brands were on show across 24 halls, as well as numerous events taking place outside the fair in central Milan. It is a true feast for the senses and a comfortable shoe is highly recommended! 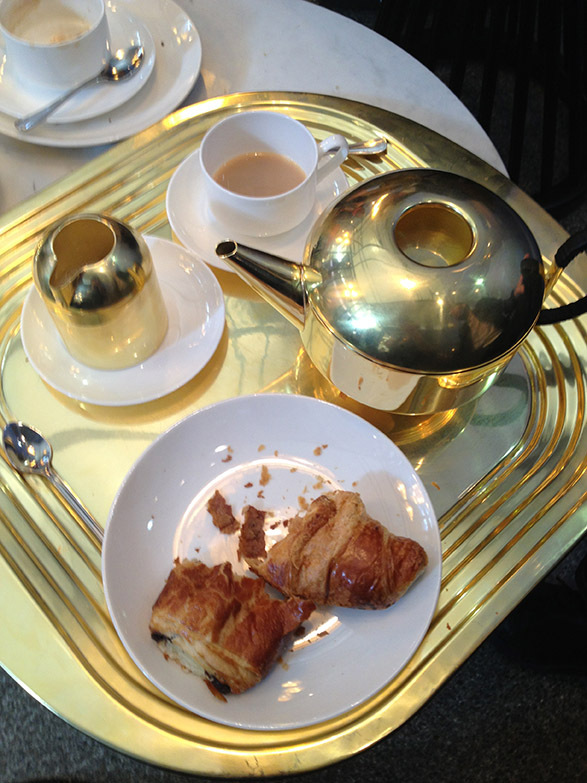 We had the pleasure to visit over three days and here are our highlights. and Poltrona Frau back at the fair and their stands and new products did not disappoint. Displaying design classics alongside brand new designs, there was a real buzz surrounding these long-standing iconic brands. 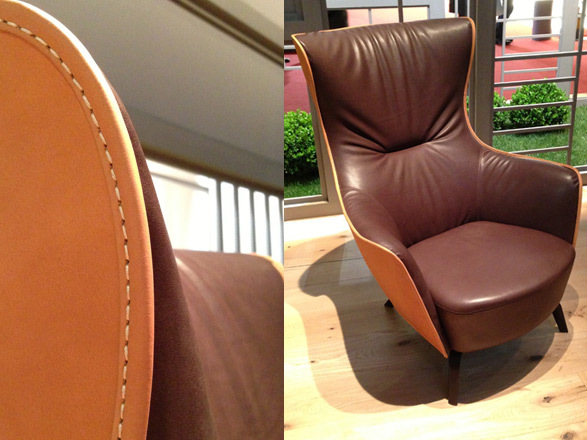 The Poltrona Frau stand exuded elegant opulence and the smell of high-quality premium leather was divine. The craftsmanship is hard to ignore and their new products - the Mamy Blue Lounge Chair and Antohn Sofa (designed by Jean-Marie Massaud) - were firm favourites. 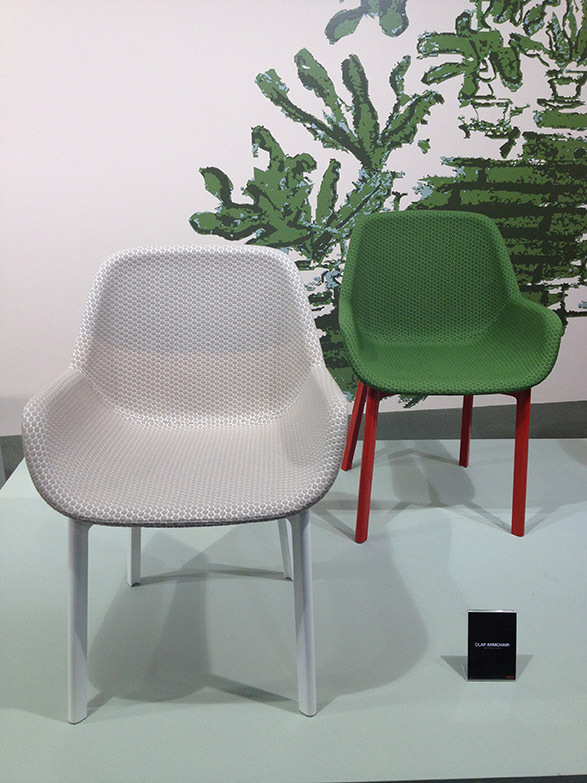 Vitra launched a variety of product extensions and this year colour was the key theme. From Hang it All’s in ice cream shades, to the classic Eames Storage Unit’s (ESUs) in fresh autumnal tones (chosen by Dutch designed Hella Jongerius), to the Prouve Standard Chair in pale yellow (citron) and dark grey (which really worked), colour was abundant. On the flip side they launched the Eames Lounge Chair in a deep black version, a very chic and aesthetic tweak to the original design, along with new bases for the Eames side chairs in dark maple, black maple and powder coated basic dark. 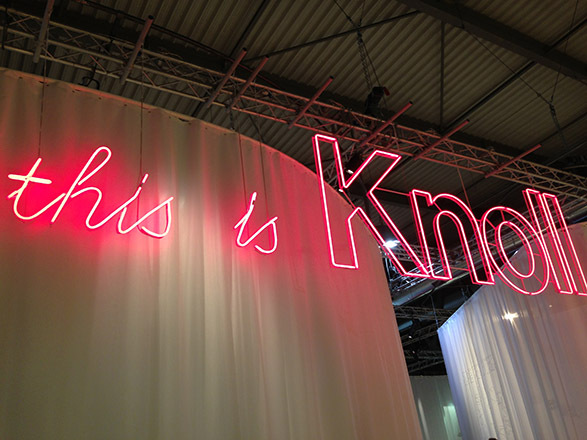 Kartell’s stand was once again all singing and dancing! The stand depicted a Galleria and products worthy of note are the new Clap Armchair designed by Patricia Urquiola and their move into bathroom design with the launch of their collaboration with Ludovica and Roberto Palomba, ‘Kartell by Laufen’. The collection includes a mirror, a container unit with shelves, a stool/occasional table, a lamp, wall shelves and a towel holder made of various colours of PMMA. Monochrome with hints of primary colour was the theme at Artek, who do this look so well. 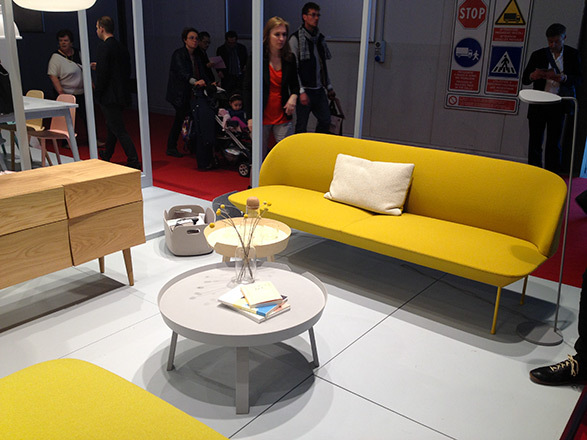 The re-issued LUKKI range designed in the 1950s by IImari Tapiovaara makes a welcome comeback. 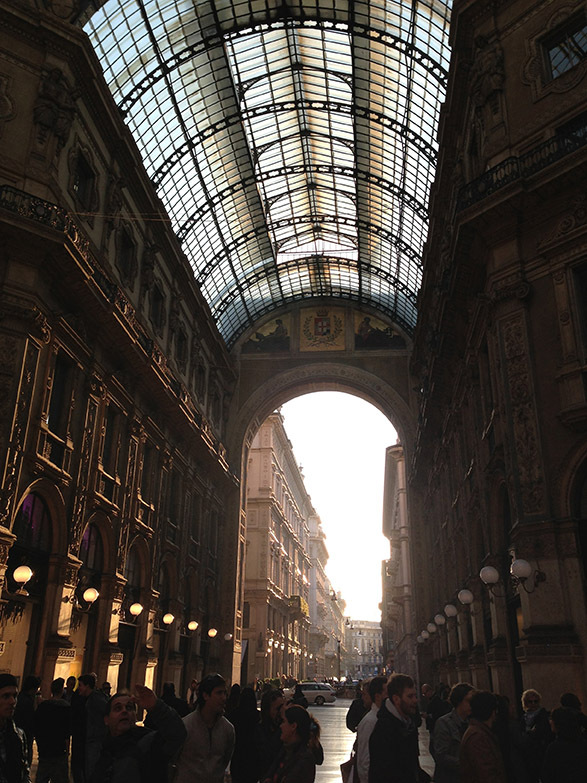 Day two was all about central Milan and ‘Fuori Salone’ what lies outside of the fairground and what a perfect day to wander the streets visiting the satellite events. We kicked off at MOST (hosted at the Museo Nazionale della Scienza e della Tecnologia) for a traditional British breakfast and a private presentation by Tom Dixon of his new ‘Rough & Smooth’ collection. 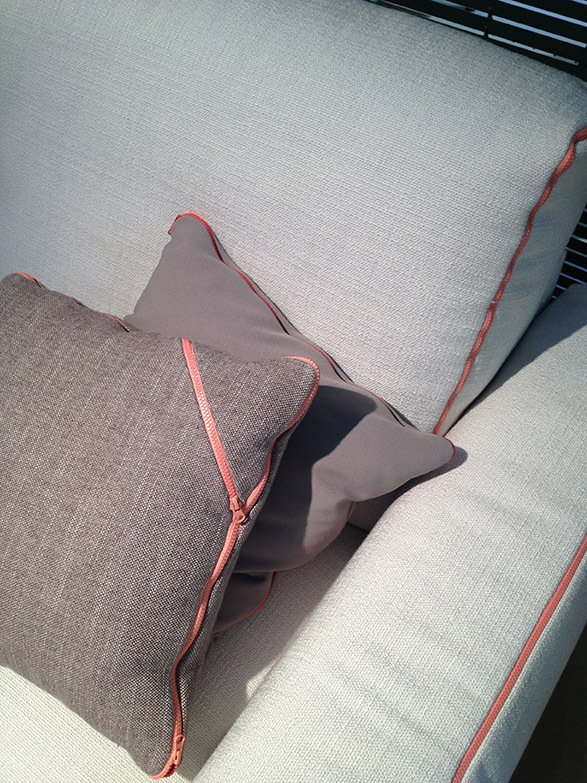 The ‘Rough & Smooth’ collection is a story of opposites, materials, honesty and textures. Inspired by the two sides of the British character the collection embodies uniqueness. The Gem range includes furniture, lighting and accessories and each piece is unique with a textural finish inspired by the natural world. The Cell family compliments their popular Etch collection and continues Tom’s fasciniation into refined precsicion engineering, manufacturing and low energy lighting. 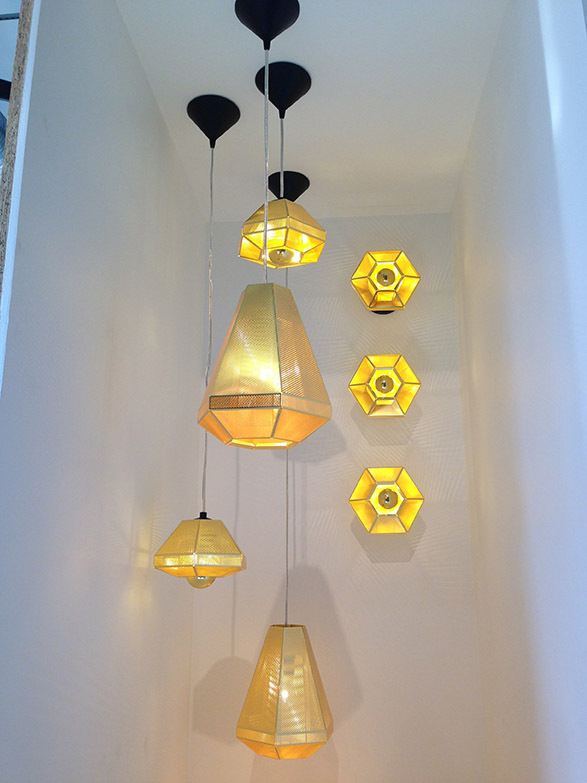 The smooth, handblown glass Flask pendant offers diffused lighting suitable for any environment and looks stunning hung in small groups. 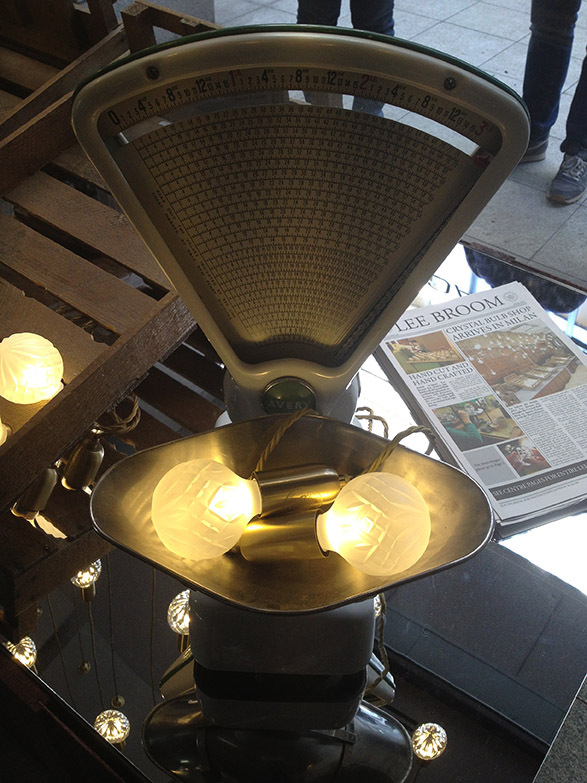 Other products launched include MASS, Bell, Spun, Fan and a range of new ECLECTIC accessories (coming online soon). 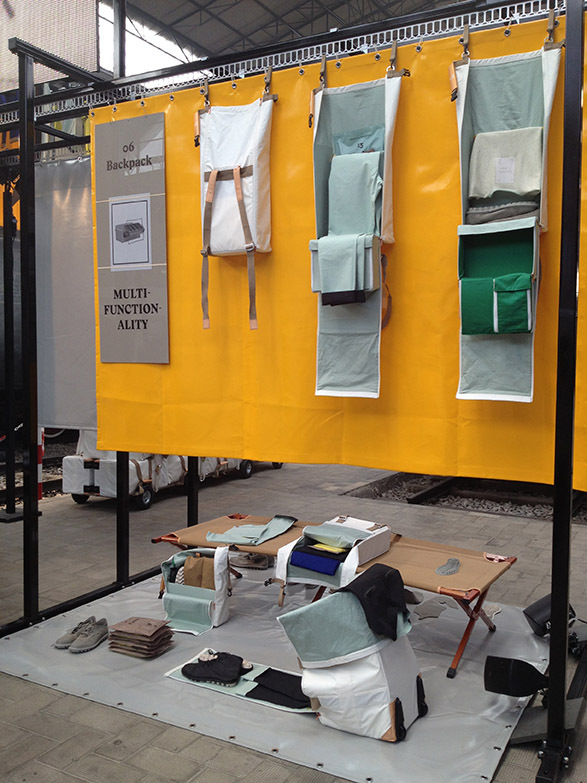 MOST had a lot to offer visitors and it was great to see new and emerging brands on show. Tom’s collaboration with Adidas to design a travelling, ‘Capsule’ fashion collection was fun, unique and, at the same time, intriguing. After a quick metro ride we ended up in the Brera design district of Milan to see what EDIT by Design Junction had to offer. 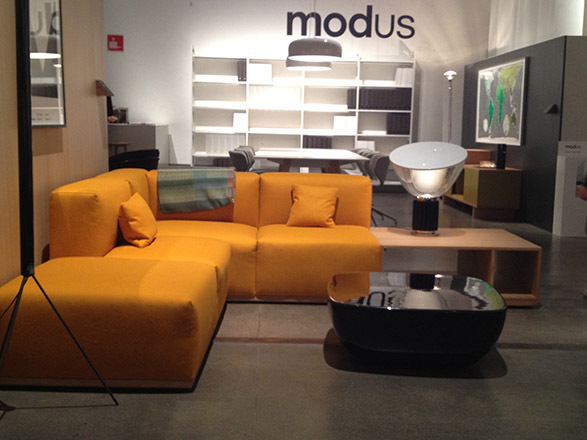 Housed in the recently rennovated La Pelota venue, it was great to see award-winning British brand Modus taking centre stage, who’s new Geta Sofa by Arik Levy was a joy to discover. It was an absolute pleasure to meet Guillane Kerschbaimer, one half of sister duo behind Atelier Areti, who’s products are lovingly hand made with quality and sustainability in mind. Ercol showcased fresh, new, contemporary designs including the gorgeous walnut and oak Svelto sideboard. A short walk led us to the traditional Lee Broom Crystal Bulb Shop for a refreshing change of pace as well as scenery. The twists on the Crystal Bulb (launched last year) were fabulous and included a frosted version, table lamp and chandelier, which we know you’ll all love. 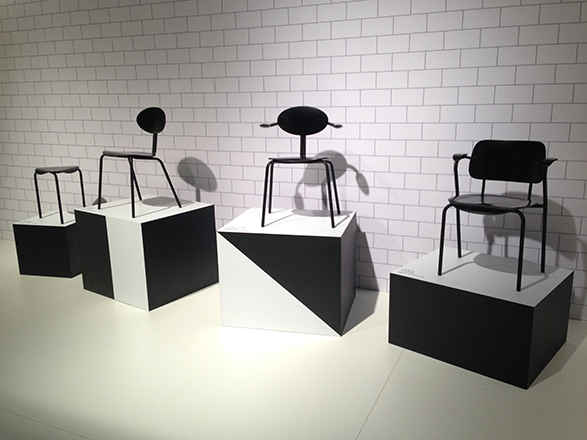 The stand-out product for us this year has to be the new Ro Chair designed by Jaime Hayon for Republic of Fritz Hansen. Ro (meaning tranqulity in Danish) is a style icon in the making and was inspired by the thought of creating tranquility in a fast-paced urban environment and exudes unpretentious glamour. 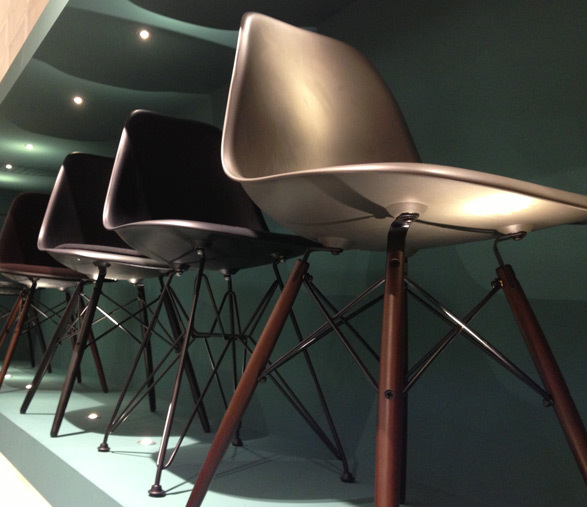 The Ro Chair is available in nine carefully selected designer colours, “colour being the most important thing you can do right now in terms of communication” says Jaime, and will be released in September 2013. Dinner took place at Savini, a favourite haunt for the world’s celebrities since the turn of the century due to it’s location close to the Manzoni theatre, across from the Duomo and in the oldest shopping mall in Italy ‘Galleria Vittorio Emanuelle II’. Dessert came in the form of an ‘Unexpected Welcome’ by Moooi in the vibrant and bustling Tortona district. 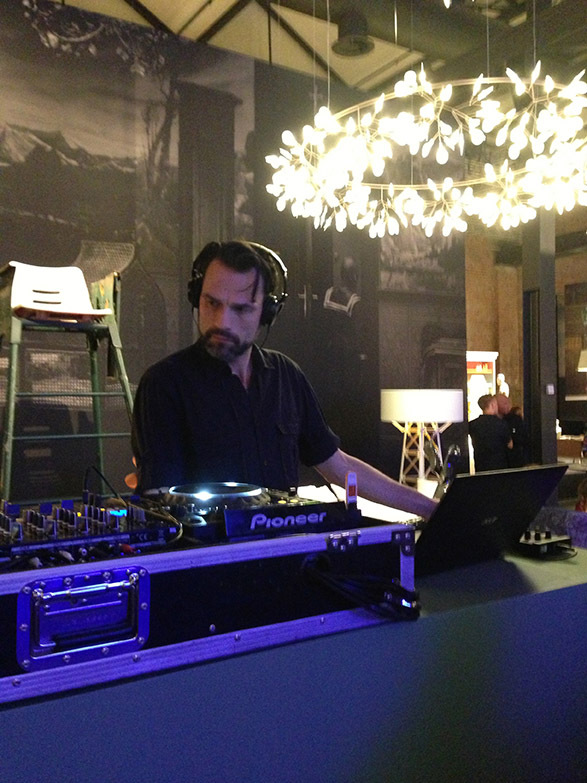 Our visit coinsided with the Frame Moooi Award 2013 event and security was tight. After some serious hustle and bustle and a fair bit of queuing we entered the 1.700m2 location which was transformed into a series of stylish living spaces inhabitated by a number of colourful and suggestive mannequins! It was great to see yet more colour here and the French house music helped to set the tone and atmosphere. 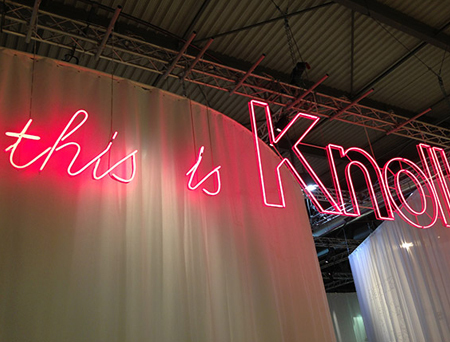 Following a well-needed sleep we started our final day back at the fair in Rho, with the morning focus being all about lighting at Euroluce. 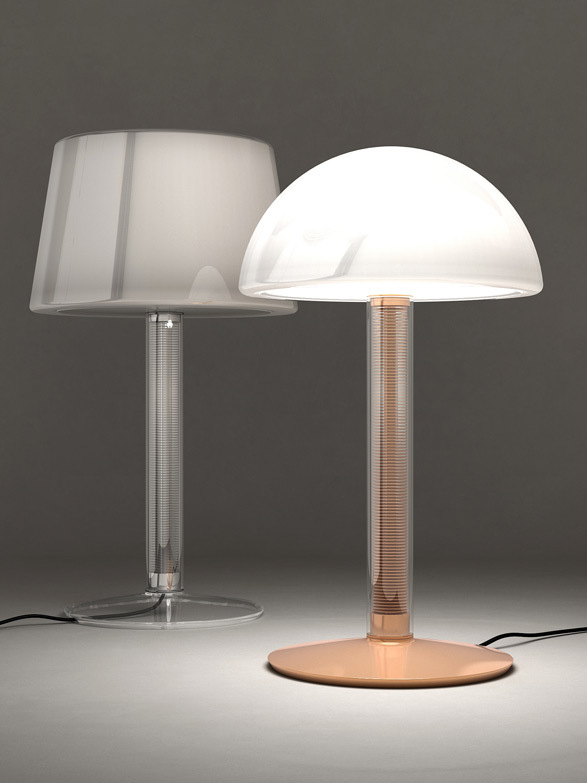 Foscarini Launched four brand new products as well as LED versions of their four best sellers Twiggy, Tress, Caboche and Big Bang. 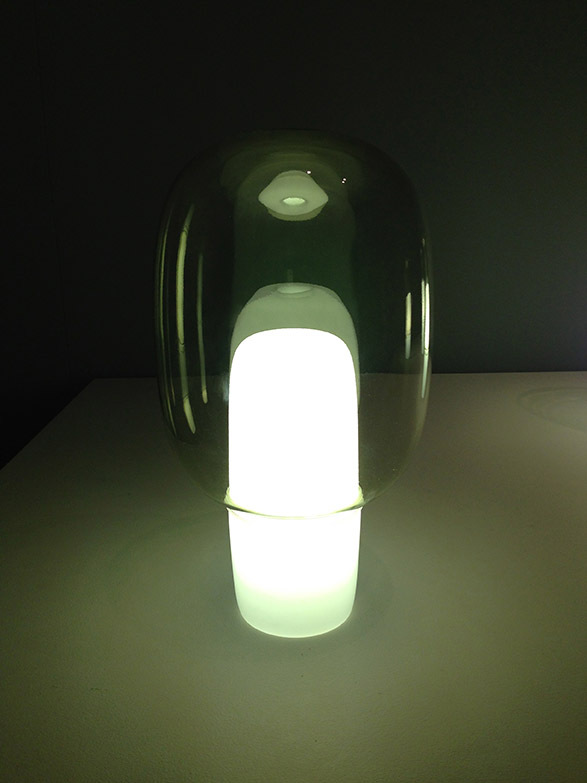 The Yoko Table Lamp designed by Norwegian designers Anderssen & Voll is reminiscent of a bubble about to burst over a light source; it is simple with a clear design focus on both form and function. 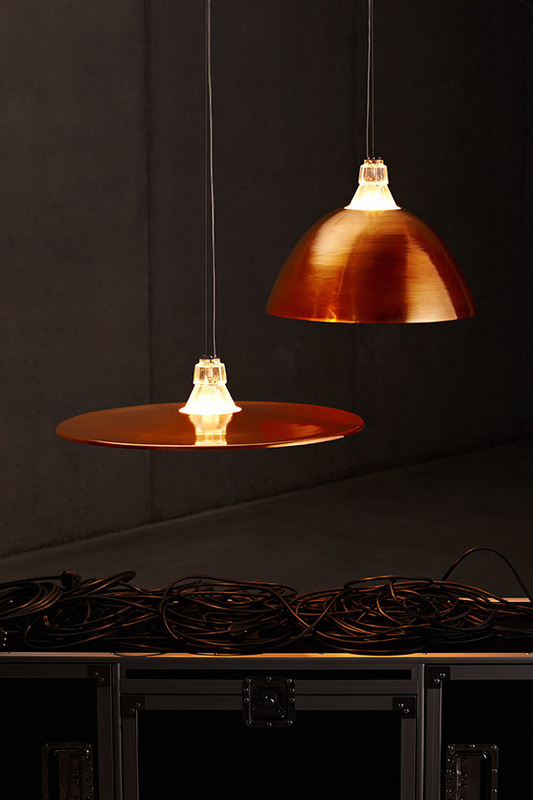 Diesel with Foscarini continued to drive forward its rock and roll theme launching Crash and Bell, a pair of suspension lamps. Crash is inspired by the top of a drum, and Bell, the percussion. 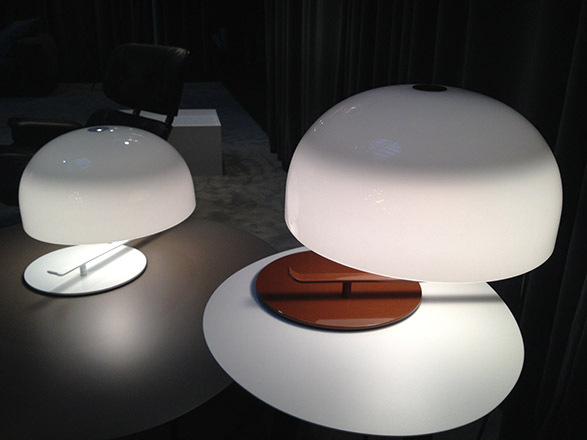 Oluce impressed us this year with a number of exciting new products, of note is the re-issued Zanuso 275 Table Lamp originally designed in 1963, and the Empty Suspension Light which gives both direct and reflected light through its light source and cleverly faceted interal surface. Soft architecture and technology was the focus at Flos and the new table lamp ‘Volt’ designed by Rodolfo Dordoni summed this up brilliantly. Rodolfo has focused on the LED heat source and the way in which it is cooled by transporting distilled water along a central tube, which he made the focal point of this fascinating table lamp with an almost art deco feel. We finished our final day in Hall 16 and we had a lot to fit in! 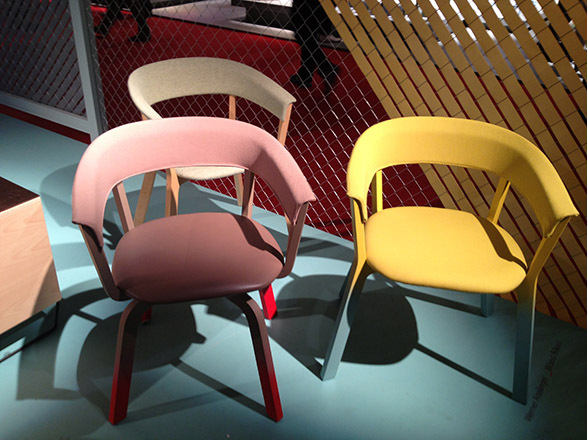 Colourful, vibrant and fun are the three key words to sum up Moroso’s optimistic and warm offering. 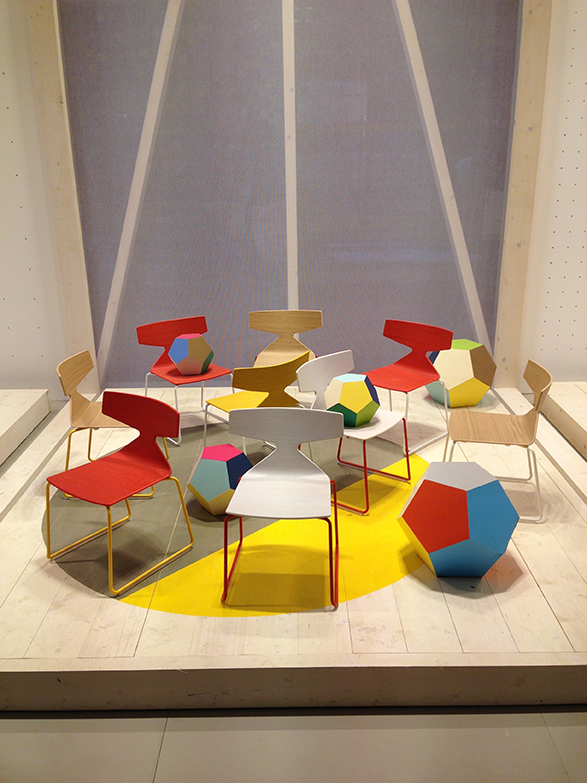 The Hood Lounge Chair by Patricia Urquiola was welcoming as were the bright fluro shades on the Wood Bikini Chairs. Relaxed sophistication with a Scandinavian edge was the theme at Arper and with a distinct move towards the family-friendly home. Their new children’s Saya Chair was super cute. Nordic brand Muuto continued to grow their collection with the launch of the new Oslo Sofa & Ottoman – which is slim, simple, curvy and very comfortable with a forgiving seating position and springy seat. Sancal launched the ‘tierra’ collection with a re-focus on the home environment and family-friendly designs in pretty shades of pink, grey, pale blue and a snip of apricot. The Tecno Sofa by Rafa Garcia is chic, practical (with removeable zipped covers), extremley comfortable and hides a wireless electronic system that enables you to move the seating position to exactly your liking. Our time in Milan this year was full and hectic but thoroughly enjoyable and we look forward to bringing you all the latest news from our next design event ‘Clerkenwell Design Week’ in May – stay tuned!